In Cops 2170: The Power of Law you´ll control Katrin, a recent graduate of the police academy, and her team of up to seven police agents attempting to eliminate the criminal element in their metropolis. It´s up to you to stop an evil genius´s plot with your arsenal of lethal weapons and vehicles. In the future, the government watches over everything therefore the safety of the public society is under their complete control. Cyber links are implanted into each newborn child marking their host with a unique ID. Cities have turned into monstrous urban centers giving the term urban sprawl a hazardous new meaning. 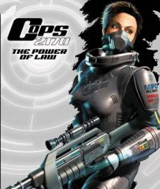 Cops 2170: The Power of Law is a hybrid of RPG and tactical strategy. The central storyline unfolds in the future where the cyberpunk culture and a highly-urban oriented society have populated North America. Players will control Katrin and her team of up to seven police agents attempting to eliminate the criminal element in their metropolis.